Ok Fab Free, brace yourselves because I’m about to reveal the depth and breadth of my nerdiness. I am a MASSIVE Lord of the Rings fan. I mean, like…super huge. And I’m NOT talking about the movies (which were visually stunning but messed my fave story up!). I have probably read the books about 20 times, and I can recite all sorts of things upside down and backwards, while muttering something about potatoes being the Gaffer’s delight. Yup, I’ve finally revealed my true self to you all. Anyone who was under the illusion that I was cool, welcome to the real world! Right, so I did have a point in revealing my love for all things Middle Earth. The Enchantment hunt is going down right now all over the grid, and you have to keep an eye out for the One Ring! I found two super awesome things in my journeys – my very Elven (ish) lingerie (sized for Maitreya) by Have Unequal is the first. I feel that it wouldn’t look completely out of place in Lothlorien…well, at least in certain situations it wouldn’t! The second item is my lovely tumbling curls by DeLa that I’m sure Arwen would be totes jelly of. Best of all, the prizes are all FREE so you can gather your Fellowship of friends together and hunt down all the precious rings! You can find all the hunt info HERE. As they say in Elvish, “Elen sila lumenn omentielvo” – a star shines on the hour of our meeting. Categories: fantasy, Free, hair, hunts, lingerie, mesh | Tags: Aline Passiflora, DeLa, enchantment, Enchantment Hunt, Euphoric, fab free, fabfree, fabulously free in SL, Fetch, free, Free Hair, freebie, Glam Affair, have unequal, JUMO, lelutka, maitreya, Second Life, Second Life Free, Second Life Freebie, secondlife, sl, sl fashion, sl free, sl freebie, sl gift, sl hunt, sl style, Sn@tch | Permalink. Hello there Fabulouses! Are you a new resident or know someone who is? Ghee has a new FREE GIFT set out that is specifically for residents that are 30 days old or younger and the nice ladies at Ghee have sent me a copy so that I can show it off to you here on FabFree! I’m also showing off a new group gift hairstyle at No.Match! Inside the New Avatars Welcome Gift, you’ll find the following items that will be compatible with your starter avatar, or with several of the mesh bodies listed below if you happen to be so lucky at such a young age!! In just one stop, you’ll have a whole new casual outfit. Skinny Jeans in the sizes listed below. Winter Wooly Sweater in the sizes listed below. Before I move onto some more freebie news, I want to just point out a couple of things also for new residents looking for free items. We have a whole list of stores that have gifts rezzed out for new residents and you can find that list [HERE]. My curly hairstyle called Carol is a free group gift at No.Match! It includes a full fatpack of colours, a texture change HUD for the bow and even and extra pair of Christmas bauble earrings (not shown today). The No.Match inworld group is 50L to join, but there are tons of great hair gifts to be had for both guys and girls. Categories: classic avatar, Free, group gifts, groups, hair, mesh, pants, shirt, shoes, Tips for New Residents | Tags: Catwa, fab free, fabfree, fabulously free in SL, free clothes for SL noobs, free group gift, Free Hair, free in sl, Glam Affair, group gift, Ikon, Love Trill, LW Poses, maitreya, Missing Melody, New avatar welcome gift, new resident gift, No Match, Second Life, Second Life Free, sl, sl free, SL Freebies, SL newbie gift, SL noob, Under 30 Days | Permalink. Hey there Fabulouses! Boy was I surprised when I was at Uber this week to find that Vinyl has a special Black Friday priced item at the event! Red Hot Sweater Dress & Red Hot Pricing! 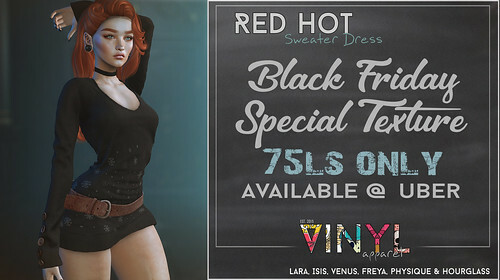 During this round of Uber, Vinyl is featuring their Red Hot Sweater Dress with a texture change belt / buttons in 16 different colours at 180L each, but also displayed with those gorgeous dresses is an exclusive snowflake printed charcoal grey version for just 75L! 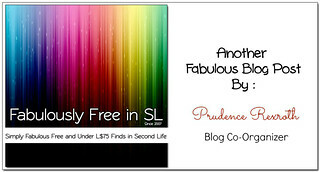 This is a colour, I probably would have chosen at full price – what a deal! It is hard to see the arms in my photo, but there are buttons on the sleeves that match the super big chunky leather belt. Categories: dress, events, Free, group gifts, groups, hair, mesh | Tags: 0L Hair, 75L, Black Friday Sale, Cae, Catwa, ChicChica, fab free, fabfree, fabulously free in SL, FaMESHed, Free Hair, free in sl, Glam Affair, group gift, Ikon, Izzie's, Love Trill, Lyrium, maitreya, navy & copper, Second Life, sl, sl free, sl free hair, Somewhere in Time, Tannenbaum, UBER, Vinyl | Permalink.